Ink and Lace with Sheryl Cauble: Celebrating Fresh Brewed Designs 100th Challenge! 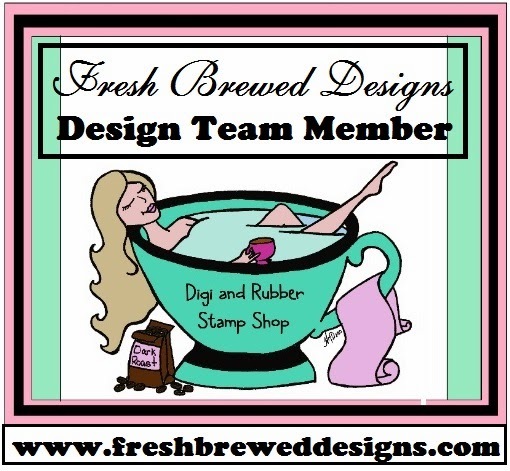 Celebrating Fresh Brewed Designs 100th Challenge! First of all, I would like to welcome my new followers! super spectacular rubber stamp sale! This is such a fun stamp to work with! was peeking out of the tub! Easy Peasy! you can purchase for only $40.00! 5 Free digi's of choice! These aren't the only stamps on sale! Heather has some fabulous digi's on sale too! I just love celebrations and big sales! Don't you? if you write that Sheryl sent you in the comment section. There are lots of ways to win prizes! Sadly, the picture I shared of the nest with 3 pretty Robins eggs inside has been abandoned by its parents! It's so sad. The three pretty eggs are still sitting in the nest all alone. The parents are no where in sight. I would dearly love to report the Robin parents to the authorities for neglect! I am off now to welcome all of the little cherubs here to my daycare/preschool. We are doing a circus theme and learning about opposites. The other day we did HAPPY and SAD clowns! facial expressions! They continued dramatizing and play acting all day long! I couldn't count how many times they had me convinced that one of them was really crying or hurt! They all turned out to be excellent actors! Today we are making those yummy Hershey Kiss and Pretzel treats for their daddy's Father's Day gift. They all made a special mug with their hand prints on them for us to put the treats inside of! What a wonderful creation! I love the image - want to jump in a cup of tea or coffee right now to wake up! Your papers are really too scrumptious for words as is your sketch. Wonderful stuff here! I am going to definitely play in this challenge and may go get some of those great deals too. Oh, I just LOVE the color combination of this gorgeous card. Super adorable image! LOVE IT! Your card is stunning Sheryl! I LOVE all of the gorgeous layers and embellies. I don't know how you create such detailed and well balanced cards. AMAZING!!! I am so sorry to hear that about your birdies. We found a beautiful little blue egg in our yard, never saw a nest? I hate that they left them there :(( so sad. I did love reading about your day with your children. I can imagine their faces and your heart skipping a beat to make sure they are ok in fear that they were actually sad or something :) hhehehe!!! Kids do make the best actors. They fear nothing and take everything on with great courage and give it all they have. It is when we get older we lose the joy and freedom and courage to be ourselves... and we look for a piece of it every day. The good thing is that we can find it if we look in the right places and trust God to lead us there. Enjoy those babies. Take care of you! Hi Sheryl - I love your card. The pastel colours are so beautiful and your flowers are wonderful. Thanks for sharing it at Lexi's Creations for our "Happy Birthday" challenge. We had a Robin's nest in our Garden this spring for the first time. The parents were very doting and the 4 chicks had been around for about 10 days, then we came home from school one day and the next was completely empty. :o( As I don't think the babies were old enough (or feathery enough) to fly, I can only assume that something "got" them. Like your nest, so very sad :o((((( I hope the parents try again. Busy day ahead at your daycare Sheryl. Sounds like you really keep them busy (or is it the other way around?!!!). What a stunning card. Gorgeous soft colors and what wonderful embellies. Love it!! What a cute card, Sheryl. Good luck and thanks for joining in on the fun at Cheery Lynn Designs challenge blog. Beautiful card, I love all the detail and your glazed cupcake! Thanks for joining us in Sassy Cheryls challenge! What a lovely card! I adore the heart and lace trim. I am a big coffee lover so if I could swim in it, I would! Thanks for sharing. Oh wow, Sheryl, what a gorgeous card!! I love the beautiful colors and the designs is fabulous!! This is absolutely stunning!! Da gibt es aber viel zu entdecken auf deiner Karte. Great card. Thanks for playing the Sassy Cheryl's Challen!! Love the ribbon and flowers. Beautiful card. Thank you for joining us at Lexi's Creations this time! Wow Sheryl, so much gorgeous detail, beautiful card. Hi Sheryl. Thank you for the lovely comments that you left on my blog, and, of course for following. I have come to visit your blog now and I think your work is gorgeous so I will be following you too now. Isn't blogging great! Love your card Sheryl, so many gorgeous layers and excellent image. What a shame about the wee birds:( We often find smashed eggs at the side of our house. I worked in a school nursery for 11 years and it was just lovely to read about your little kiddie winkles, brought back lots of memories. Wonderful card - gorgeous colours and so many fabulous details. Your card is fabulous Sheryl I love all the added detail and the design of it, your blog is brilliant and I am now your latest follower. The children must love coming to you for care it sounds like they have great fun there. I felt so sad for the little robin eggs. Gorgeous card. I love the colours and all the pretty embellishments. What a fun, girly card! So many details. Thanks so much for joining us at the Cheery Lynn Designs Challenge and good luck! That soft blue and pink is such a pretty combination and you've got some of the prettiest embellies on this card. Love the cupcake and yummy lace. Sweet as can be Sheryl! Hugs! WOW, Sheryl! This card is gorgeous!! I love the color scheme, design, and everything about this card! :) Thanks so much for visiting my blog, commenting, and becoming a new follower! Can't wait to get to know you! What a gorgeous card! I love all the details you put into it, such lovely papers too! Those poor little birdies...I had to go back through your blog to find the photo of the eggs. We always have a bird's nest under our deck too and the three eggs in our nest have hatched and they are gone now. It was nice to watch the mother bird bringing food for her babies, they grew up quickly! Thanks for playing along at Twisted Tuesday Challenges this week!